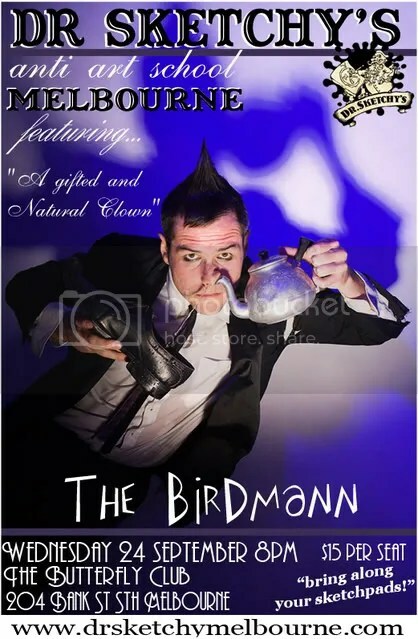 Renowned vaudeville humourist, the highly skilled Birdmann, is one sophisticated and daring performer. With an ill-fitting suit and gravity defying mohawk Birdmann is a styling combination of surreal circus sideshow and charismatic comedy. Birdmann is incredibly original though reminiscent of Houdini, Chaplin, and Dada. Feats of wonder for your delight can include object balancing, knife throwing, plastic bag juggling, escapology and many more moments of oddity from the strange to the sublime. Birdmann has traveled nationally and internationally and for emceeing, short sharp acts and big extravaganzas for the stage or outdoors Birdmann is a man like no other man.